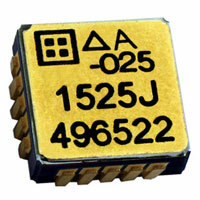 ETLG Inertial Aerosystems: The model 1525 is a low cost MEMS accelerometer in a 8mm square SMD package. Claimed to be the best in class, the sensor combines long term stability and low noise. Each JLCC hermetically sealed package contains a precision capacitive sense element and a custom signal conditioning hybrid. An internal temperature sensor facilitates temperature modelling to optimise performance. Available in +/-2g and +/-5g ranges (higher g ranges available) the 1525 is aimed at tactical inertial navigation, instrumentation, seismic and tilt measurement applications. Each accelerometer is marked with a serial number and a calibration test sheet shows measured bias, scale factor, linearity, operating current and frequency response.